Note from GaryR: We were fortunate to have an intern, Patrick, in our department for the summer. He has since returned to college, but during his time here at Agilent Technologies, he successfully completed several projects for us. During his last week, he wrote a power supply blog post! Here it is, unedited!! Hello, I am Patrick, an intern here at Agilent Technologies. This is my first blog post but you might recognize me as “new intern… named Patrick” from the Matthew Carolan insta-classic, “What is Command Processing Time?” And as “Uncredited Waveform Capture Author” from GaryR’s visually-stunning, “Current Limit Setting Affects Voltage Response Time” I might not be able to provide the same engineering life lessons Mr. Brorein, Mr. GaryR, and Mr. Carolan provide you monthly but hopefully you will enjoy this post nonetheless. As you can probably tell from the title, this blog post is the first in a series written to help readers find the right DC power supply for them. For starters, there are a lot of other power supply companies out there; their products are not mentioned here. Actually, I better give you a disclaimer: this is an Agilent blog post about Agilent products written by an Agilent employee. However, my intentions in this post are to inform our readers on how to find a reliable and dependable power supply to the best of my abilities. I simply do not know enough about non-Agilent DC power supplies to be able to confidently recommend you any. With that out of the way, today’s post is written for college students, like myself, but can help give some insight to anyone looking for a power supply. Agilent Technologies offers over 200 models of DC power supplies. Finding the perfect power supply for your needs is possible but can take some time. Fortunately, you have found your way to this blog post where I have already done all the work. The first step in finding your power supply to buy is to determine your budget. If you are financially disabled like me, you are really lucky if you can save up $300 - $500 dollars between buying textbooks for a personal power supply. If you need convincing on why you make the expense, Matt’s “The Joys of Owning a DC Power Supply” brings up some good points. Personally, I like being able to work where I want and when I want, including at my home during the summer where I would be lucky to find working batteries let alone a power supply. Also with the lifespan these power supplies have, this is a piece of equipment you will be using for decades. So first, figure out your budget! The next thing to determine is what are you using this power supply for? Are you a hobbyist who only has low power needs? Do you need to power multiple DUTs at once for a senior project? Maybe you need a very precisely regulated and accurate output for a research project? If I wanted to work on labs outside of school I would need a supply with multiple outputs. If I wanted to work on side projects in my spare time my requirements are a lot simpler. Figure out what your performance requirements are, and try to anticipate future projects if you can. Now, how much space do you have to work with? Power supplies come in many different sizes. In a test rack, a smaller power supply means more room for other test equipment. As a student you probably are not going to have a test rack, but you might have a test bench. If your test bench is anything like mine, it is also your laptop table, study space, dining area, and entertainment center. As you do before you buy a new couch, make sure you measure before you buy your new power supply. For a student, here would be my priorities when shopping for a power supply: inexpensive, compact, and capable. All Agilent power supplies already provide low noise and well regulated outputs, so you do not have to worry about that. But keep in mind what functions and features you would like. For example, it would be nice to find one with an autoranging output characteristic, which would essentially allow one to perform the job of multiple, and/or a computer interface. 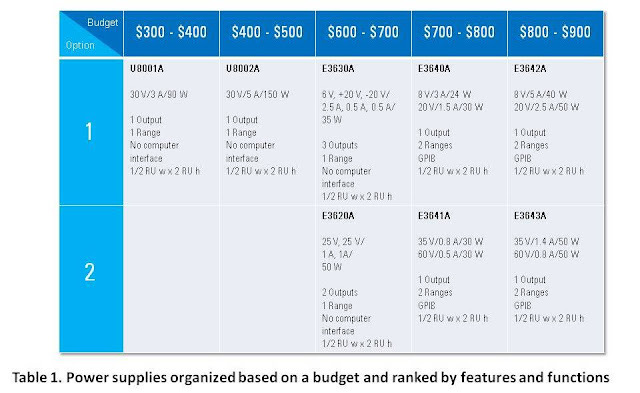 For those with similar priorities as above, shown in Table 1 are the power supplies that you might like. The table was populated with power supplies listed in our “Agilent Power Products Selection Guide”. The row on the top represents the base (no options) price range of the power supply if ordered from Agilent. The column on the left side represents your best choice in that price range. Keep in mind that the only difference in some budget ranges is the voltage/current ratings, which is important for your application but does not necessarily make one power supply better than the other. Within the table, each square states the model number of the power supply, voltage/current/power ratings, number of outputs, and number of ranges, available computer interfaces, and dimensions. The output ratings are sometimes separated by commas or there is another set listed below the first. If the power supply has multiple outputs, then each output is separated by a comma. If the power supply has multiple ranges, then each additional range is listed below the first. To use Table 1, simply find your budget range and then match your application needs to the available models. Models in the same budget range but have increased functionality are placed higher. The two families of power supplies that fall into the sub $1,000 price range are the E3600 and U8000 series basic power supplies. 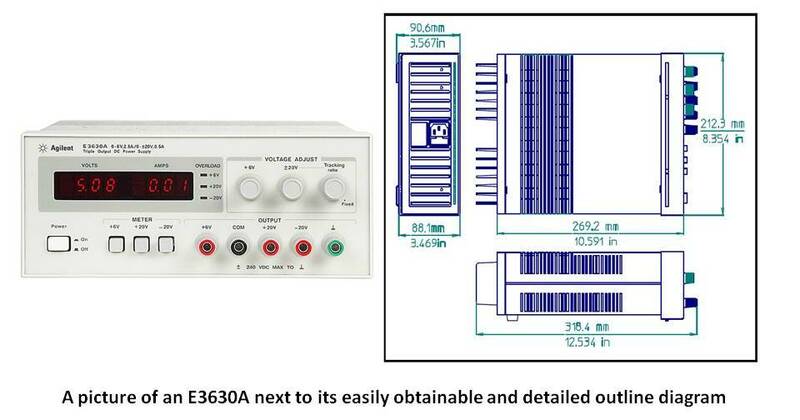 The E3600 gives you a lot of voltage/current choices, a number of outputs, as well as the ability to program with it in four of the options listed above. The U8000 is more limited in all these aspects but is more affordable and has features typically found only in programmable supplies such as OVP and OCP protection, recall states, and more. See for yourself how the E3600 and U8000 stack up against other power supplies. All the power supplies listed above come in a ½ RU w x 2 RU h, with 1 RU being equivalent to 19” width and 1.75” height. This size is compact and will have no trouble fitting on a desk, and when not being used can easily be moved and stored. It is unfortunate that there is no relatively inexpensive Agilent power supply with autoranging output characteristics. At least there are choices (within the E3600 series) with multiple ranges, giving you more output flexibility for more applications (learn more about rectangular vs. autoranging output characteristics). 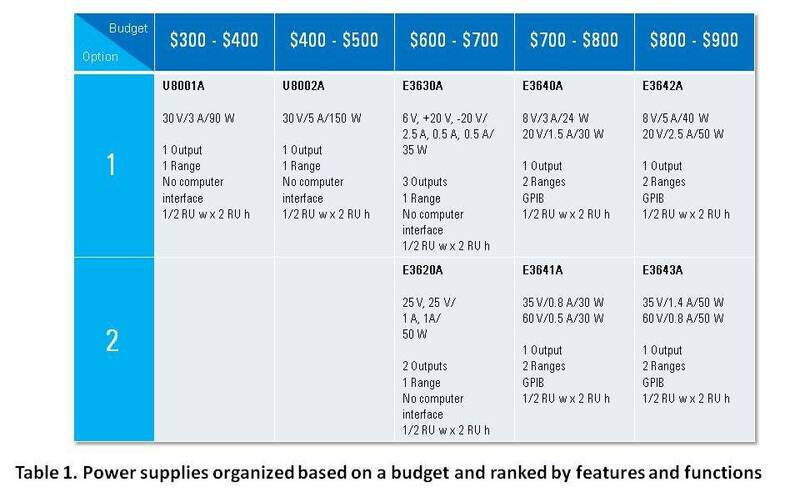 Also there is a three output power supply on the list (the E3630A) which is in the middle of the pack in terms of budget. 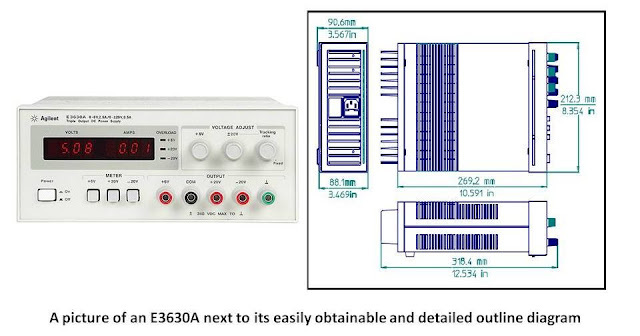 The E3630A is actually the same power supply available at my school laboratories, able to handle every exercise I have done so far. As a student, these power supplies might be outside your budget, but the least expensive choice, the U8001A, is about the same price as a Play Station 3. Would you rather choose: “fun” (the PS3) or “FUN!” (a power supply)? Please note that the distinguishing lowercase and uppercase variations of the word fun is not a reference to the level of fun but rather how loud I would yell it at you if we were face-to-face. So, I have listed out your choices. All you have to do is figure out which one fits your applications. If you do not know what your applications are then you already missed a step in this blog post, so start over from the beginning. If you do not have an application then you probably do not need a power supply, but thank you for taking the time to read this. If you cannot find the right power supply for your application in this post then keep saving your money and look out for the next part on, “How to choose a DC power supply”, that is where the real fun starts. If you read this post and succeeded in choosing a power supply then awesome. Thanks for reading!